It was during the Neolithic period that megalithic monuments began to appear in Ireland. Standing stones, stone circles, enormous graves and monuments are evident throughout the island but more evident in the northern half of the country, particularly the court tombs which are concentrated in Ulster and north Connaught. At Carrowmore in County Sligo is the largest megalithic cemetery in Ireland and it is considered the oldest in Europe. The complex has over 80 monuments which include passage graves, chamber tombs, ring forts and cairns. It is overlooked by the massive Meascan Maebha or Queen Maebh’s tomb on the summit of the hill of Knocknarea. Portal tombs (dolmens) likewise are predominant in the north but are also found in Wexford, Waterford and around the Galway bay area from the Burren to Conemara. 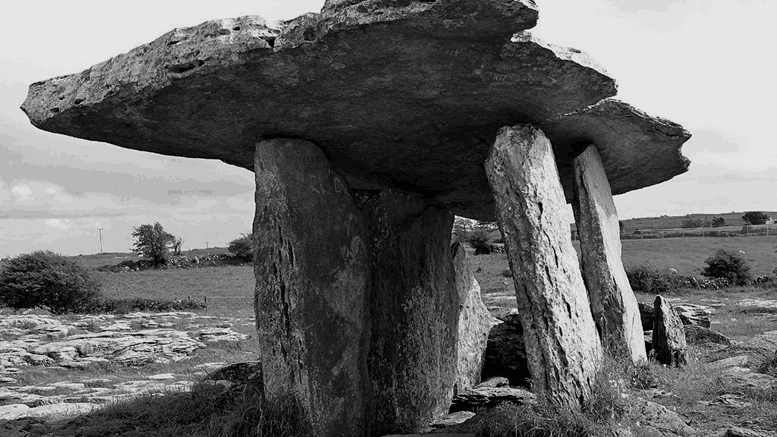 One of Ireland’s best examples of a portal tomb is the Poulnabrone Dolmen. Passage graves, such as Newgrange and the other great tombs of the Boyne Valley complex, are found in the East and North of the island. They are also found in Brittany. There is another type of grave which is much simpler and more concentrated in the south. They are the Linkardstown graves named after a site in County Carlow. These have a polygonal chamber paved with stone slabs and lined with inward leaning large stones and covered over with a capstone and covered with a mound. Normally they would hold the remains of one person. It is thought that these different grave styles may indicate differences in religious belief. We do not know for certain why they were built but can surmise that it was to please the Gods and to give honor to notable ancestors. What we do know is that these monuments do not stand in isolation for similar structures dot the landscape of the entire western seaboard of Europe from Iberia to Denmark. The Mesolithic and Mesolithic-Neolithic Transition in Ireland by Killian Driscoll. Lithics Ireland Consultancy. Landscapes of Neolithic Ireland by Gabriel Cooney. Routledge. Oxon OX14 4RN. 2000. Neolithic Settlement. Significant Unpublished Irish Archaeological Excavations 1930-1997. An Chomhairle Oidhreachta, The Heritage Council.